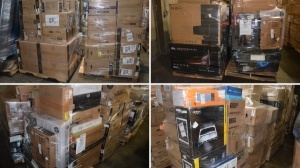 We carry a small range of Electronic or Electronic Accessory Wholesale Liquidation Lots. Please review the listings below for further details. Loads are full manifested. Unless otherwise specified the condition of the goods are Customer Returns. The Large Majority are in their original retail packaging as returned by the consumer. Architek is made slim but built strong. The case features serious dual-layer protection: an impact-resistant, transparent outer hardshell and co-molded, shock-absorbing inner Diagrid, or diagonal grid core. Inspired by Chicago's structural architecture, the Diagrid inner construction reduces the overall weight of the product significantly without sacrificing impact absorption performance. Together, both layers make for an ultralight, signature LUNATIK designed case that's as aesthetically pleasing as it is. New overstock Architek branded iPhone 5c cases in a variety of colors. Packed 150 assorted units per case. Items are new and in original retail packaging with hang tags, ready for retailing or wholesaling! Packages may show signs of wear from transportation and warehousing but actual items are in new condition. Cases are all for iPhone 5c in a variety of colors. Architek is made slim but built strong. The case features serious dual-layer protection: an impact-resistant, transparent outer hardshell and co-molded, shock-absorbing inner Diagrid, or diagonal grid core. Inspired by Chicago's structural architecture, the Diagrid inner construction reduces the overall weight of the product significantly without sacrificing impact absorption performance. Together, both layers make for an ultralight, signature LUNATIK designed case that?s as aesthetically pleasing as it is protective. 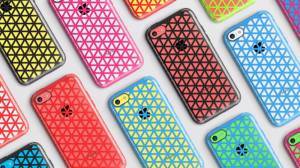 Architek celebrates the iPhone 5c with colorful protection to the core. Over $5,200 in original retail value per lot! Excellent for online resale and retail stores! Please note: Items do not have UPC codes printed on the packaging or the item itself. Retail value per item is $8. Total Retail value in each case lot is approx $1,200. Goods are in their retail packaging and ready to sell! 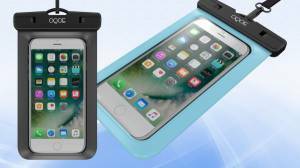 Each case includes approx 150 units of assorted colors of New Overstock OQOE universal waterproof cases. Retail value per case is $8. Total Retail value in each case is approx $1,200. Your price is just $1.25/case or $187.50 for the case. Goods are in their retail packaging and ready to sell! [Unlimited Uses] - The OQOE Waterproof bag is primarily used underwater, but can also be used on your next big adventure hiking, rafting, fishing, swimming, boating, kayaking, snorkeling, water park and many more activities! [Simple in Design] - Simple yet Strong. The clear plastic lets you take pictures underwater or in any dirty, snowy, or any other environment where you do not want your phone damaged. Complete functionality of your phone through the case. [Fully Equipped] and ready to use - Clear windows on both sides for full functionality of your phone including taking pictures. You will be ready for your next big adventure! Use it as an iPhone 6 case, an iPhone 7 case, or any phones up to 6” in diagonal length. The versatile OQOE Universal Waterproof Case Bag fits all devices up to six inches diagonal, including Smartphones, iPhone, Samsung, Sony, HTC, LG, Motorola, Nokia, and Blackberry. The universal size is perfect for carrying your belongings. The resilient OQOE Universal Waterproof Case Bag allows you to enjoy your active lifestyle without worrying about harming your device as the case bag protects your phone or device from elements such as dirt, dust, sand, and-yes-even water! Each case bag is tested under water for two hours to ensure resilience. The durable OQOE Universal Waterproof Case Bag features a strong rope buckle, a secure swivel lock, and dual-sided clear windows providing security, dependability, and ease of use. This allows you to snap photos, send texts, or respond to emails without removing your device from the case. The airtight OQOE Universal Waterproof Case Bag does not interfere with your active outdoor lifestyle. Feel free to participate in your other favorite outdoor activity without leaving your device behind or worrying about protecting your device. Approx. 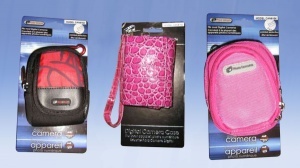 58,457 assorted digital camera cases in a variety of styles, colors, and sizes. This liquidation includes approx 58,457 assorted units of digital camera cases. Goods are in their original master cartons. The load includes a variety of styles, colors, and sizes. Brands include, but not limited to: Designs by Milan™ & Photo Concepts™. Asking just $0.15/unit, or $8,768.55 for the load. This load will require two 53’ trucks for shipment. Great product for Retailers, Wholesalers, Online, or Export! 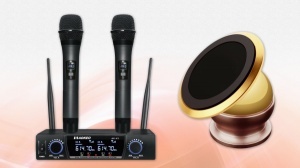 Opportunistic Liquidation of New Overstock Aokeo Professional Microphone Equipment, Accessories, Car Mounts, and more! This liquidation includes an assortment of 4,612 units of New Overstock Aokeo professional microphone equipment, accessories, car mounts, and more. The load includes, but not limited to: Professional USB Condenser Microphones, Professional 8 Channel UHF Wireless Microphone Systems, Wireless Handheld Microphones, Wireless Lavalier Lapel Microphone Systems, Handheld Wireless Microphones, UHF Wireless Handheld Microphone Systems, Magnetic Car Mounts, and 4 channel professional UHF wireless microphones. Please review the manifest for details. The color variation is unknown. The magnetic car mounts will come in a variety of styles and colors, and the exact mix is unknown. The total retail value of the load is $175,095.96. Retail values per unit range from $19.99 to $550. Your price is just 17% of Retail, or $29,766.31. Great product for Retailers and Online Sellers! 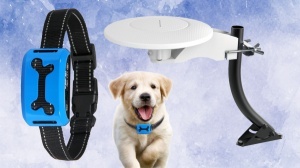 This liquidation includes 965 units of New Overstock Elecwave 70 Miles Digital HDTV Antennas and 1500 units of New Overstock Colpet No Bark Collars. The Antennas retail for $17.50/unit. The No Bark Collars Retail for $20/unit. Your price is an average of $3.80/unit, or $9,377.50 for the load. 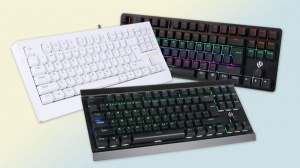 This liquidation includes 3,328 New Overstock units of assorted LeoBog Wired Mechanical Keyboards. The load will include the following models: K23, K23W, K21, K21W, K20, K20W, & K27. All models, except the K23s are Wired Mechanical Keyboards with Blue Switch. Please review the downloadable pdf for details and specs on each model. The goods retail for between $30-$50/unit. The total retail value of the load is over $118K. Your price is just $7.13/unit, or $23,738 for the load.